You guys, I feel so blessed to have so many lovely blogger and small business owning friends! More specifically, I feel so so so honored to have some of them featured on my little blog's sidebar! These lovely ladies believed in Sweet Lavender Bake Shoppe enough to want to help sponsor it this month, and have their blogs and websites featured! I mean..... gosh. Some I've known for a while, some I've only just begun to develop a friendship with, but ALL I truly believe in and just LOVE! Each and every lovely lady has some sort of crazy artistic trait and I am so happy to represent them this August! Jewel over at Eat Drink Shop Love truly has an eye for all things design and is honestly so up to date on the trends! I mean, really- her posts are packed full of some of the loveliest places to find the perfect piece of furniture, what's "in" now fashion-wise, and/or where to find an absolutely yummy new restaurant to try! Also, if she's not traveling around and offering tips and advice, she's in her kitchen creating scrumptious recipes for us at home to give a whirl. Speaking of recipes, these strawberry basil popsicles are calling my name! 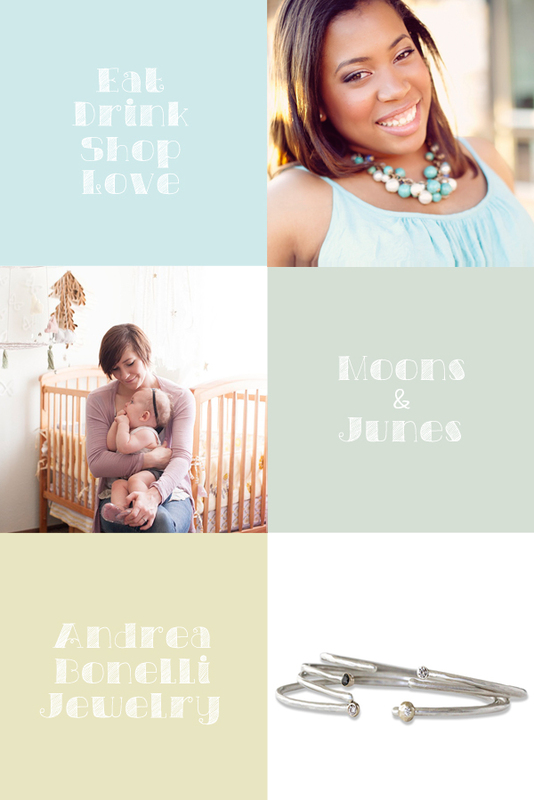 At Moons and Junes, you can find Shayla talking about all things life and baby (speaking of baby, her little one is ADORABLE!) To be honest, what first caught my eye was her blog's design and aesthetic- I just love it. She has such a great way of incorporating a certain rustic, Native American design element, with modern twists. Make sense? Good. It was her beautiful dream catchers and mobiles that caught my attention and after talking a little bit, her sweet heart and personality kept me coming back for more. Andrea, of Andrea Bonelli Jewelry has been a favorite of mine for some time. I think she was one of the first people I actively followed on Twitter! Ha! Her shop is filled with, by far, some of the most gorgeous, unique, and amazing jewelry pieces I've seen yet. Everything is made (BY HAND) by Andrea, and are ALL eco friendly + sustainable! So so cool. Not only that, but her pieces are pocket friendly for all price ranges :) Some of my favorites include her Sapphire and Citrine Ring, the Sterling Silver Textured Bangle, and the Stardust Textured Wedding Ring! Make sure you guys take a little peak around and see what they're all about!